This PTS guide is for Flight Instructor Rotorcraft (Helicopter & Gyroplane). The Practical Test Standards (PTS) guide students, instructors, and FAA-designated examiners through checkrides. Every PTS details the skill and knowledge that must be demonstrated before an examiner can... read full description below. This PTS guide is for Flight Instructor Rotorcraft (Helicopter & Gyroplane). The Practical Test Standards (PTS) guide students, instructors, and FAA-designated examiners through checkrides. Every PTS details the skill and knowledge that must be demonstrated before an examiner can issue a certificate or rating to an applicant. 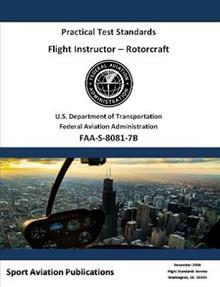 Written by the FAA, these books list the knowledge and experience prerequisites, the levels of skill that must be demonstrated before an examiner can issue a certificate or rating to an applicant, and describe background study and reference materials. The FAA is presently working on updating the PTS to the ACS (Airman Certification Standards), but as of this release date (2019) an ACS for Flight Instructor Rotorcraft has not yet been published by the FAA (includes changes 1, 2, & 3).